The U.S. Supreme Court ordered California on Monday to reduce the population of its jammed prisons by more than 30,000 in two years to repair a health care system that lower courts found was defying constitutional standards and endangering guards as well as inmates. Federal judges rightly found that overcrowding in a prison system that has held nearly twice its designed capacity for more than a decade was the main cause of “grossly inadequate provision of medical and mental health care,” the court said in a 5-4 ruling. “Needless suffering and death have been the well-documented result,” Justice Anthony Kennedy said in the majority opinion. He cited evidence from two decades of litigation: mentally ill prisoners waiting up to a year for treatment, suicidal inmates held for 24 hours in phone booth-size cages without toilets, waiting lists of 700 inmates for a single doctor, and gyms converted into triple-bunked living quarters that breed disease, and violence victimizing guards and inmates alike. A federal judge found in 2006 that shoddy prison health care in California was responsible for the death of one inmate a week, Kennedy noted. “The medical and mental health care provided by California’s prisons falls below the standard of decency that inheres in the Eighth Amendment,” which bans cruel and unusual punishment, said Kennedy, joined by the court’s more liberal justices. 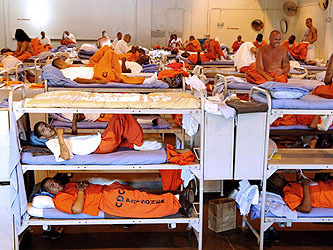 Under the ruling, California’s prison population of 143,000 must be reduced to 110,000 by mid-2011. NASA and SpaceX To Launch First Private Space Station! Previous: Kung Fu Panda 2 trailer Rocks!